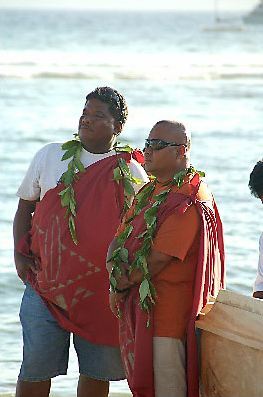 Memorial Day weekend of 2008 found us at my favorite place on Earth: Lahaina, Maui. 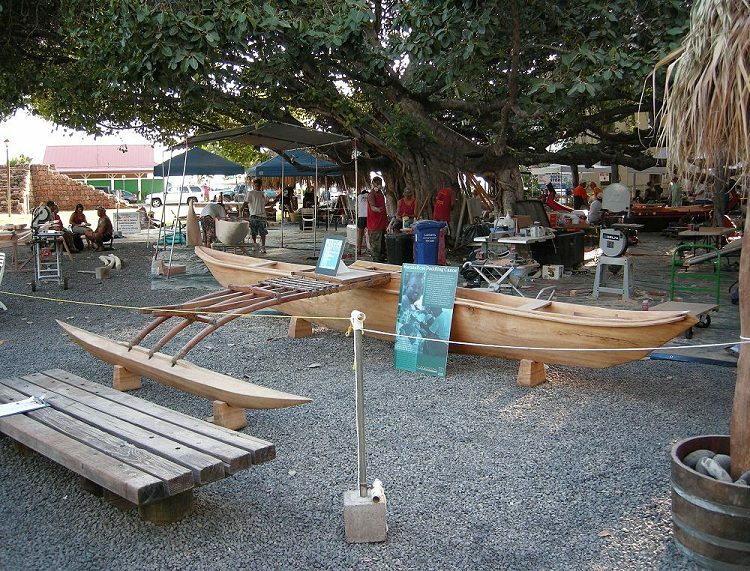 Back then, Lahaina hosted the International Festival of Canoes - an event where teams throughout the world begin with big tree trunks and chain saws and compete to build a winning canoe. 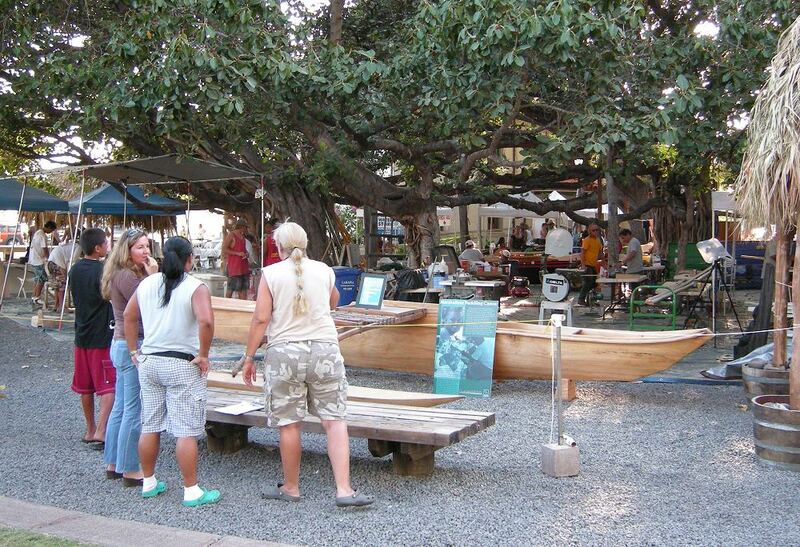 Any excuse to go to Lahaina is enthusiastically embraced, and any time to gather under the Banyan Tree when the homeless crazies have been displaced is guaranteed to be special. 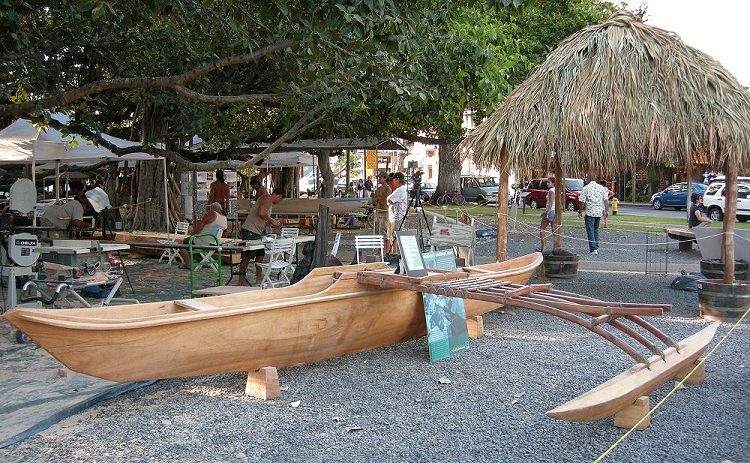 People incorrectly assume that these canoes are made from the beautiful Koa wood found on the islands and in Martin and MacArthur Stores. 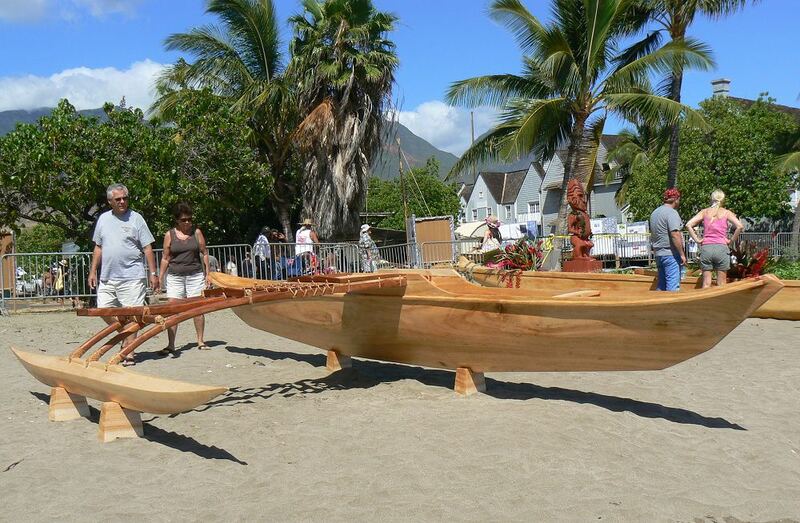 Wrong, a Koa tree big enough to build a canoe is now rare and worth a kabillion dollars. These and most carved Hawaiian canoes are made from Albizia wood brought in from the Big Island. During the first week of the canoe festival, the Albizia logs are hollowed out in Kamehameha Iki Park, then moved to Banyan Tree Park for the finishing work. 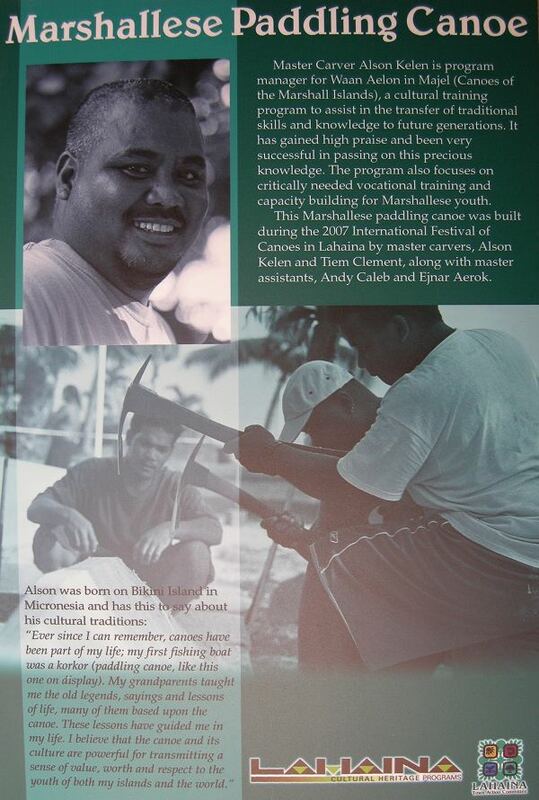 We walked among skilled craftsmen putting finishing touches on traditional canoes with their modern power tools. 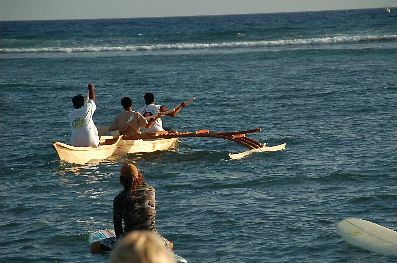 There was a silent charity auction for a three-man 21-foot long outrigger canoe built by the Marshall Islands team the previous year at this same event. 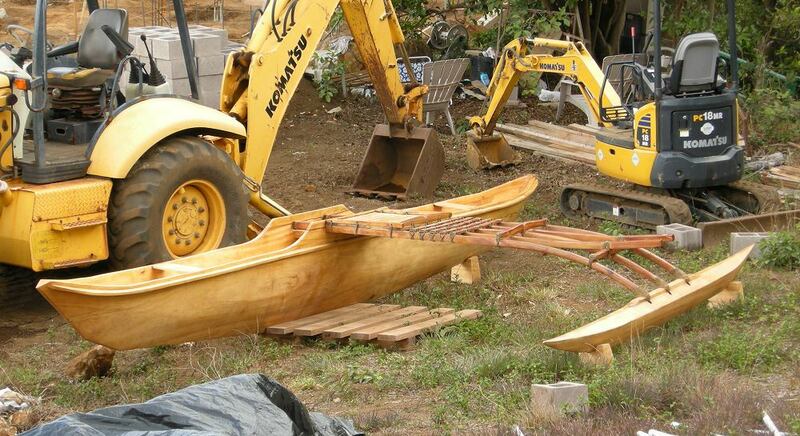 The time was two months into the building of our house, and I thought this canoe would be perfect in a Koi pond directly outside our dining room windows. 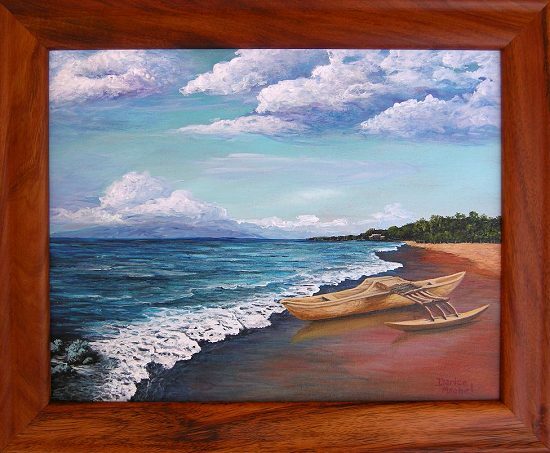 Why not build a resort-style hut to shelter the canoe, where Mai Tais and Lava Flows could be served? This wasn't like the cigarette lighter impulse purchase at the checkout stand. 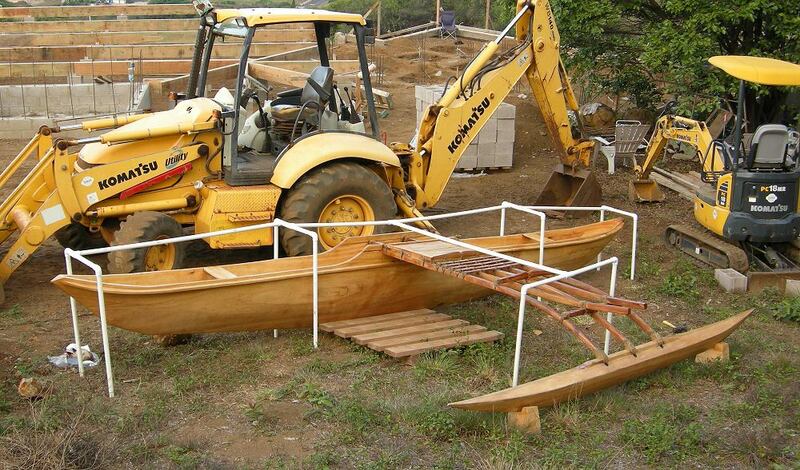 I had already investigated several respected canoe builders and determined the appropriate size. 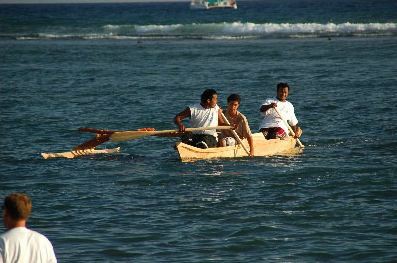 And this canoe was way bigger and nicer. The silent auction sheet was short, the bids were about half the cost of building, and there was less than an hour left until the close of the auction. 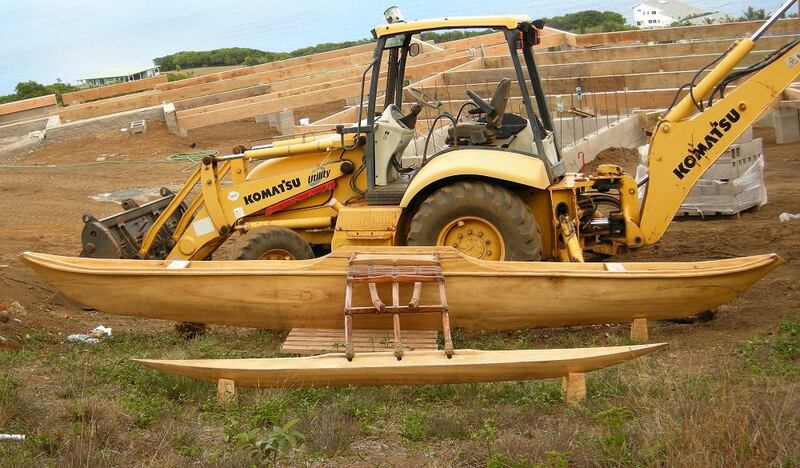 If another bidder walked up they would overhear impromptu exaggerated flaws with this canoe. No other bidders came. 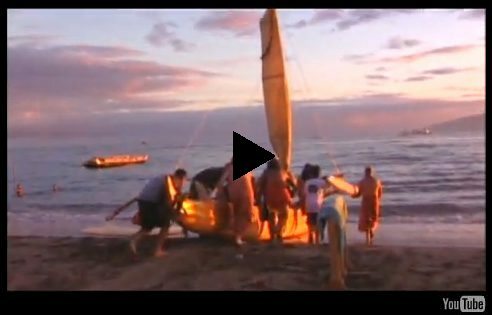 Since the money was going to the a real charity - the Lahaina Cultural Heritage Programs, there was that tax deduction, right? 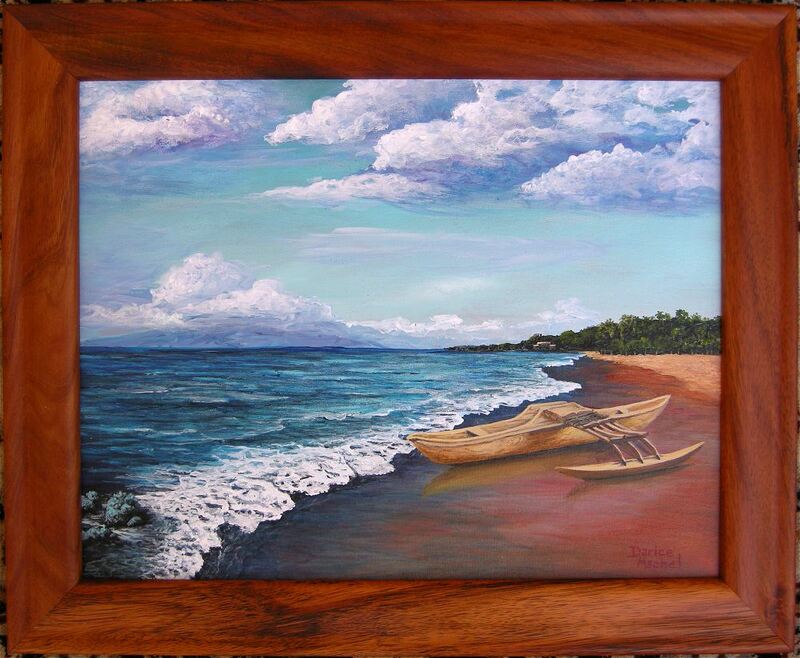 That would be the difference of the canoe's market value and the winning bid - something like negative $5,000. OK, so no tax deduction, and never mind the timing was just six months from the beginning of the biggest economic collapse of my lifetime. 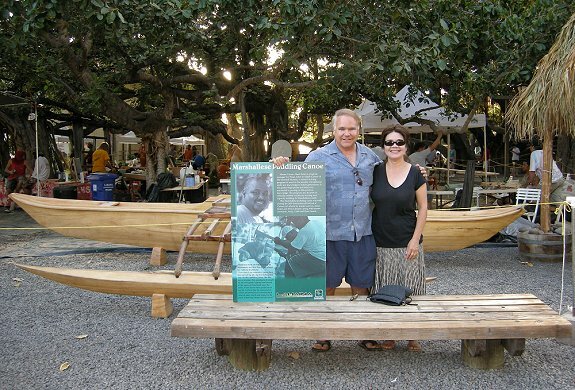 Oh, we also got the promotional signs, paddles, and the carved wooden bailer. 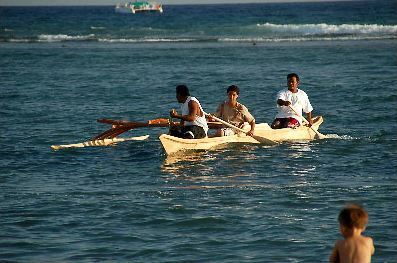 You correctly concluded that this page wouldn't exist if I had not "won" this beautiful canoe. 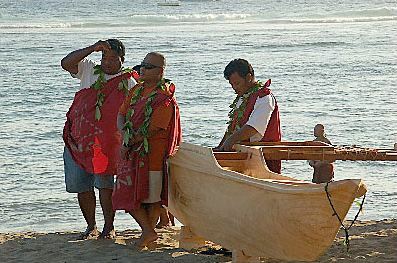 Several members of the Lahaina Cultural Heritage Programs staff offered to help transport the canoe to my lot on the opposite side of West Maui. 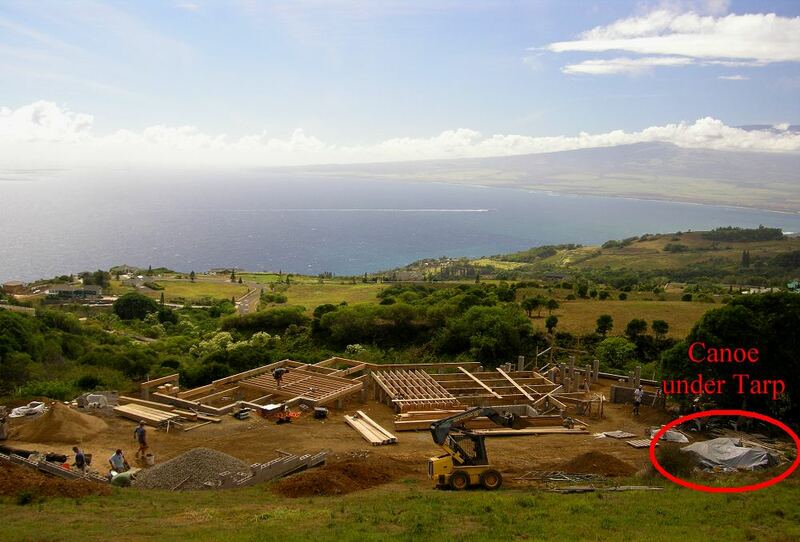 A week later I paid a trucking service for delivery, and the framers of the house carried it off to the side of the construction site. 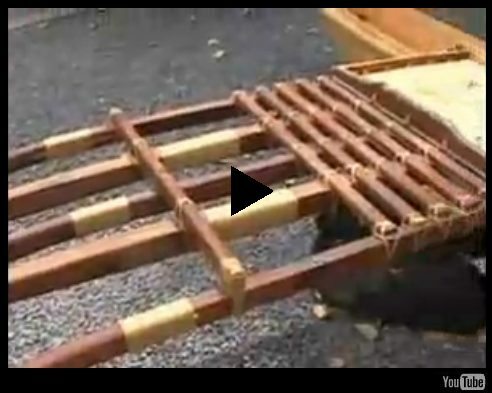 Three giant tarps and three-and-a-half years later, building began on the hut for the canoe. 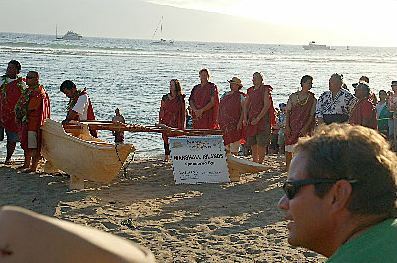 A launching of the completed canoes was held on the last day at Lahaina's oceanfront park. 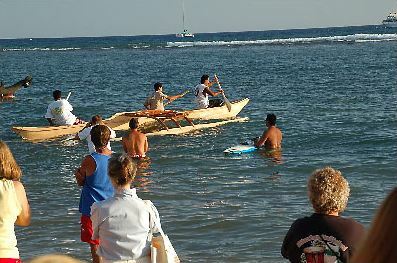 Crowds gathered on the beach near sunset to watch the traditional launching ceremony. Once called "Maui's Signature Cultural Event," Lahaina no longer hosts the International Festival of Canoes. 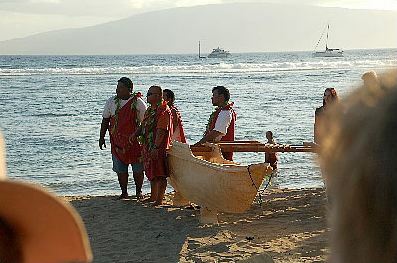 Like Lahaina's famous Mardi Gras of the Pacific at Halloween, the Canoe Festival is gone. 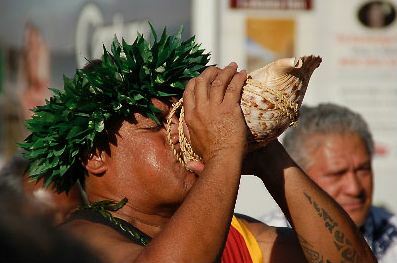 Do not fret, the Chinese jewelry stores and the activities brokers still abound in Lahaina.